The Essendon tramway depot was established by the North Melbourne Electric Tramway & Lighting Company in 1906 to serve its lines through Essendon and Maribyrnong. The gable roofed car shed, designed by Ussher and Kemp architects, and built by George Meyer of Ascot Vale, is the only extant part of the original depot. After the Essendon tramway was taken over by the Melbourne & Metropolitan Tramways Board in 1922 a saw tooth roof extension to the original car shed, constructed by Thompson & Chalmers Pty Ltd, was made in 1924, and an overhead tower wagon shed was erected by Massey & Sons. A further extension to the car shed was built by McDougall & Ireland in 1941-42, and the two storey brick office building, erected by EA Watts, was added in 1944. The Essendon tramway depot is of historic and architectural importance to the State of Victoria. The Essendon depot is historically important as the earliest operating tram depot in Melbourne and as an integral element of the Melbourne tramway infrastructure. The Melbourne tramway system is nationally significant as the only tramway network remaining in Australia. (A single route still operates in Adelaide). It is the tenth largest system in the world and has the third largest number of routes and services. 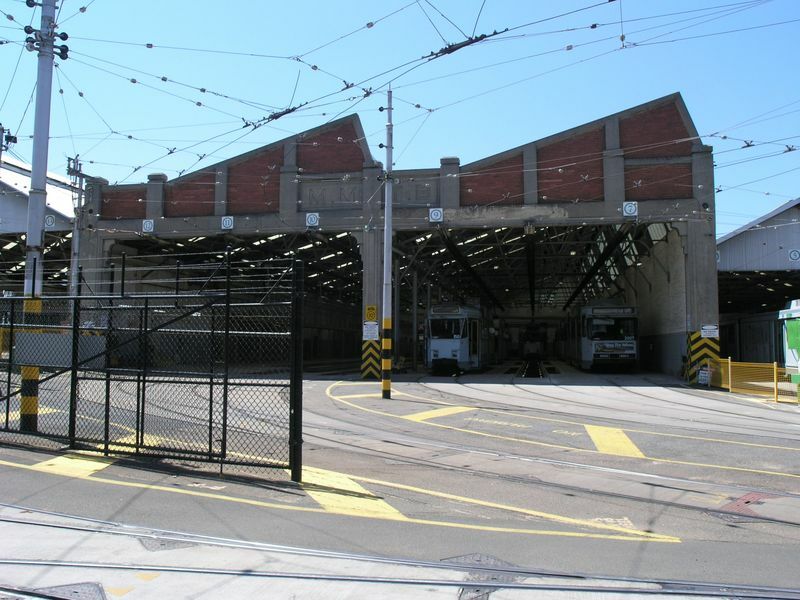 The original car shed is individually important as it is the sole remaining structure of the only Melbourne electric tramway system built and operated by a private company - all other lines were established and operated by municipal and government authorities. 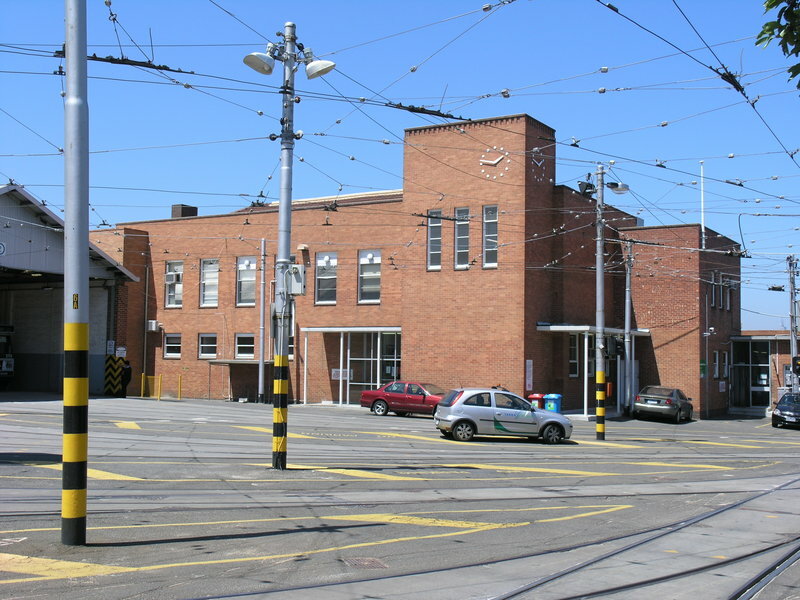 The Essendon depot is architecturally important because the complex of buildings illustrates the diversity of building styles of the development phases of electric tramways since 1906 - the original tram car shed constructed by the company and the subsequent development by the Melbourne & Metropolitan Tramways Board (M&MTB) which assumed control of the tramway in 1922. Works undertaken by the M&MTB include the 1924 car shed extension associated with the conversion of the cable tramways and the construction of new electric lines, and the austere car shed extension and International or Functionalist style office building built during the Second World War for new services to the munitions and aircraft factories in Maribyrnong and Essendon. The lofty overhead tower wagon shed is a representative example of a special type of building associated with electric tramways. Essendon tramway depot, Mt Alexander Road, Ascot Vale, Moonee Valley City Council. 1. 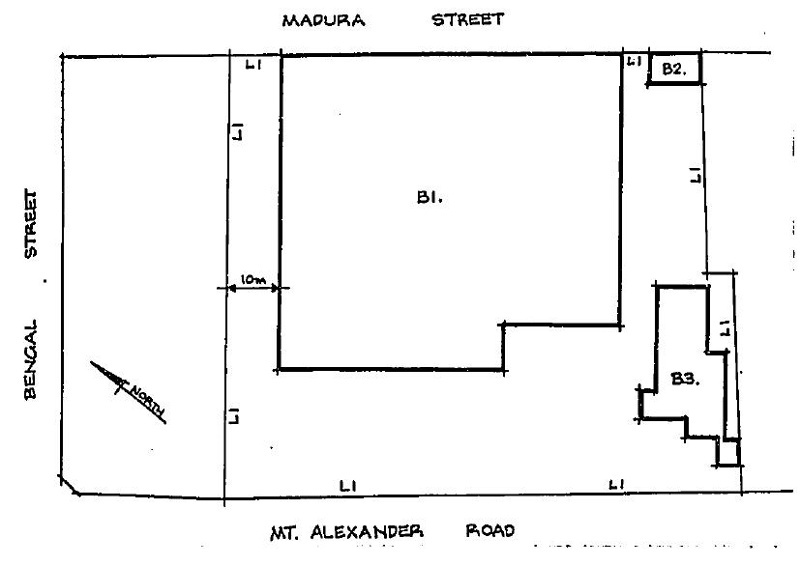 All of the buildings marked B1, B2 and B3 on Diagram 607278, held by the Executive Director of the Heritage Council. 2. All of the land marked L1 on Diagram 607278, held by the Executive Director of the Heritage Council, being all of the land described in Certificates of Title Volume 4955, Folio 990871 and Voume 4955, Folio 990872. During the 1880s a comprehensive network of cable tramways was constructed in central Melbourne and the surrounding suburbs. These tramways were built by the municipalities and operated by a private company. At the time of their construction the use of electricity to power trams was still in the experimental stages of development, but by the late 1880s the construction of practical electric tramways became widespread. In June 1888 a private company proposed installing an electric tramway through Essendon commencing at the terminus of the North Melbourne cable tram line at Flemington Bridge, but the scheme did not eventuate. During the following year a pioneer electric tramway, constructed and operated by a private company began running between the rural villages of Box Hill and Doncaster. This was the first electric tramway to operate in Australia, but was short lived owing to the depression of the 1890s. Soon after the turn of the century electric tramways were introduced to Ballarat and Bendigo and in May 1906 the Victorian Railways Department opened an electric tramway between St Kilda and Brighton. Meanwhile A E Morgans, a private investor from Western Australia, proposed installing electric tramways from Flemington Bridge to Maribyrnong and North Essendon, and generating and distributing electricity. Government approval was obtained and Morgans’ rights were taken over by the North Melbourne Electric Tramway & Lighting Company which had been formed in London. The tram depot and power generating station was constructed in Mt Alexander Road, Ascot Vale and the tramway opened on 11 October 1906. Prior to the tram services public transport through Essendon was provided by the main trunk railway from Melbourne to north-east Victoria, a service of horse drawn omnibuses from Flemington Bridge to Moonee Ponds, and horse drawn cabs. The Railways Department had earlier opposed construction of the Essendon tramways for fear that it would affect their revenue. In 1919 the Melbourne & Metropolitan Tramways Board (M&MTB) was formed to take over and consolidate most of the various separate tramways then in existence. In addition to the central cable tram system the board took over five municipal electric tramway undertakings which had come into being following the opening of the government built St Kilda-Brighton electric line and the privately constructed Essendon tramway in 1906. Difficulties arose when the M&MTB tried to take over the Essendon tramway company’s business, and it was not until August 1922 that this was finally achieved. The power generation side of the company’s business was assigned to the newly formed State Electricity Commission and the company’s generating station was soon closed and demolished. In 1925 the M&MTB closed the outer section of the North Melbourne cable line along Flemington Road, from Flemington Bridge to Abbotsford Street and replaced it with an electric tramway. This new line junctioned with another new tramway which began in West Coburg, passed through Royal Park and entered the city via William Street, thereby avoiding streets occupied by the cable trams. These arrangements therefore enabled electric trams from the previously isolated Essendon lines to have direct access to the city. The M&MTB subsequently duplicated the single-track sections of the company’s original tramway and during the Second World War the Maribyrnong line was extended to serve the large complex of munitions factories in West Maribyrnong and the North Essendon line was extended to serve the aircraft factories. The Essendon depot thus played an important role in the provision of transport facilities for the war effort. The North Melbourne Electric Tramway & Lighting Company’s depot and generating station was erected on the east side of Mt Alexander Road in 1905-06. The brick buildings, designed by architects Ussher & Kemp, comprised a triangular shaped two storey office building on the street boundary, behind that a gable roofed six track car shed, and to the north a large single storey power generating station. The power station had a large brick chimney and behind the station stood a tall cooling tower structure. The car shed was designed to house 28 trams. All that remains of the original complex of buildings is the car shed, which was built by George Meyer of Ascot Vale. Late in 1923, soon after the M&MTB took over the Essendon tramways, tenders were called for the erection of brick sheds to accommodate overhead tower wagons, and construction of a new six track car shed immediately south of the original car shed. This building was required to house the new W Class trams which were to provide services to the city from the new West Coburg line, and to provide additional trams for the Essendon and Maribyrnong lines which were routed into the city. Massey & Sons constructed the tower wagon shed for the tender sum of 1,529 pounds. Thompson & Chalmers Pty Ltd were the successful tenderers for the car shed, with a bid of 13,171 pounds . A further six track car shed was built south of the existing car sheds in 1941-42 to house eighteen extra trams to accommodate the increased services required for the munitions factories in West Maribyrnong McDougall & Ireland were the successful tenderers with a bid of 4,110 pounds . To cope with the increased staff required by the wartime services to the munition and aircraft factories the board erected new traffic offices in 1944 . This two storey red brick building is situated south of the car sheds. E A Watts was the successful contractor with a tender of 12,259 pounds . The Malvern depot comprises the original car shed and office complex (1910-11), designed by architect Leonard Flannagan, and a second car shed and substation (1929) designed by the M&MTB. The original depot, built by the Prahran & Malvern Tramways Trust in 1910-13, was the first, and later became the largest of the depots constructed by a number of municipal tramways prior to the formation of the M&MTB in 1919. The Trust was the most significant and successful of all municipal tramway undertakings and its services were largely responsible for the development of the residential suburbs south of the Yarra. Malvern depot is expressive not only of the formative decades of electric tramway development in Melbourne, but also of the subsequent years of development under the M&MTB. The former Hawthorn depot, an imposing American Romanesque style brick structure designed by Flannagan, is the most intact and unaltered of all the depots from the formative era of the present electric tram network. The building is significant for its association with the Hawthorn Tramways Trust, which became the second most important municipal electric tramway undertaking in Melbourne. 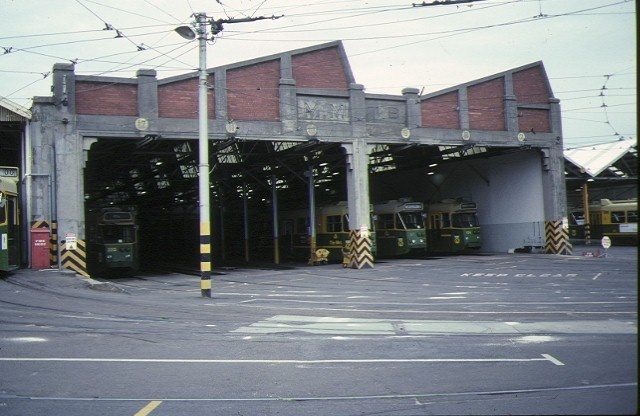 The Essendon depot predates both the above complexes and is the earliest electric tramway depot still operating in Melbourne. The Elwood depot (1907) is the only contemporary Melbourne electric tram depot, but it closed in 1956, and is now derelict. It comprises two gable roof corrugated iron car sheds, which replaced the original buildings destroyed by fire in 1906. The Bendigo tram depot (1903) is slightly older than Essendon depot and is of similar style and scale. It comprises two gabled roof bays housing six tracks, and associated offices. The Historic Buildings Council placed this complex under examination in 1990. It is currently used for tourist tramway purposes and is the only extant example of a Victorian provincial tramway depot. new poles and cable supports. fan and car sheds with new bitumen/concrete paving. 3. The repair or replacement of tracks in the depot fan. 5. The repair or replacement of all underground services. including, but limited to, emergency lighting, sprinklers and hydrant system. office building is to be retained. of replacement carpets and flexible floor coverings. 9. Installation of curtain tracks, rods, blinds and other window dressings. fixtures, including associated plumbing and wiring. original light switches, pull cords, or GPO's are retained in-situ. paintings, mirrors, and other wall-mounted works of art. 15. Installation of bulk insulation to the roof space. 16. Installation of smoke detectors. aerials / and making good.